This much-resharpened fluted knife has been pieced together from fragments found 13 years apart (1980 and 1993) at an ancient tent-site along a fossil channel of the Magalloway River. It is one of two finished fluted knives on record for the Vail site. 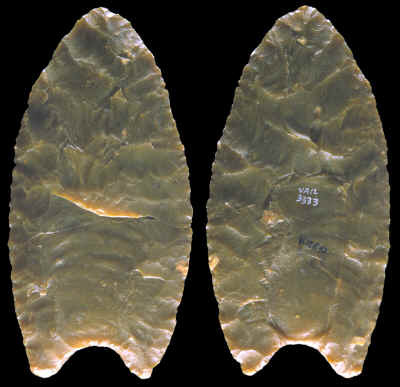 Similar knives were discovered at the Lamb site, western New York State. They have also been reported from western Kentucky Clovis sites, Tennessee, Illinois and Missouri. 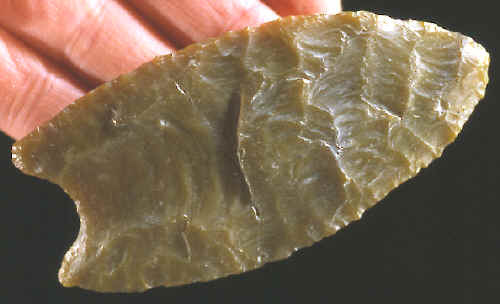 Fluted knives usually lack the pronounced basal grinding that is characteristic of Clovis projectile points. Some specimens show conspicuous silica phytolith sheen along their cutting edges, suggesting that they were used to cut plants in addition to other materials. The raw material of this knife is high quality jasper, which may have originated in Pennsylvanian-age rock formations of Rhode Island, eastern Pennsylvania, or places even more distant from northwestern highland Maine. This picture shows both sides of the original fluted knife that was found several years ago on the Vail site. It measures 3 11/16 inches (9.3 cm) long. Personal communications with Richard Michael Gramly, Ph.D.